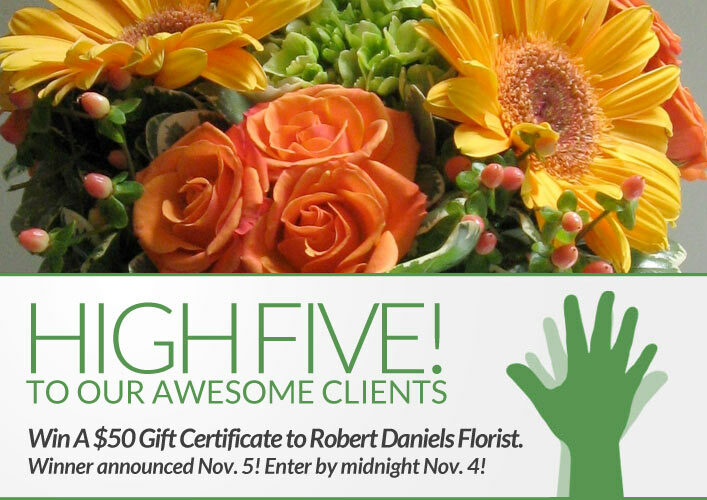 Win a $50 Gift Certificate To Robert Daniels Florist! Congratulations to Erik Schnitger on winning our fourteenth High Five Giveaway and thank you to all who entered. Our next giveaway is for a $50 gift certificate to Robert Daniels Florist. Arranging fresh flowers is done by dozens of florists. But creating fresh, unusual, and stunning flower arrangements to match the personality of the recipient is unique. And having a shop filled with decorative gifts, in addition to breathtaking fresh flowers, green plants, and flowering plants, is uniquely Robert Daniels Florist. Robert Daniels Florist is located at 40 West Lake Street. Visit their website or call them at 312-332-0500 for more information. This is an easy one…When and where is our 2012 Holiday Party?! Now, just add a comment to this post with the right answer to be eligible to win! The winner will be announced on Monday, November 5. Entries must be received by midnight on Sunday, November 4. Good luck! Thursday, December 6 at Hard Rock Cafe! !